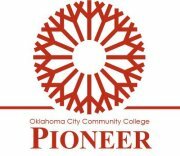 The Pioneer, OCCC’s student newspaper, won four awards during the 2013 Better Newspaper Contest presented by the Oklahoma Press Association June 13. The paper competed against several other student newspapers from colleges across the state including the University of Oklahoma’s OU Daily and Oklahoma State University’s Daily O’Collegian. The Pioneer won in four of eight categories entered: second place in Editorial Content, third place in Photography, and fourth place place in News Content and In-Depth Enterprise. Judges used each newspapers’ overall content in determining the winners. For its third-place win in the Photography category, the Pioneer was commended for its attention-grabbing action photos. Coverage of last year’s May 20 tornado brought a fourth-place win for In-Depth Enterprise Reporting. Former Pioneer Editor and Lab Assistant Paris Burris attended the ceremony, collecting the awards. Burris said the Pioneer is no stranger to OPA honors. News Writing professor and Pioneer Faculty Adviser Sue Hinton said the awards indicate how well OCCC journalism students fair when transferring to major universities. Hinton said the Pioneer’s OPA awards, both past and present, are a result of how much the paper has progressed throughout the years. “We have a track record,” she said. “Last year’s staff did well in this competition and the staff we have now, we expect will do well in next years competition. To view the results of the 2013 Better Newspaper Contest, visit www.okpress.com/2013-better-newspaper-contest-results. For more information about OPA, visit www.okpress.com or call 405-499-0020.